The Texas Rangers head to Kauffman Stadium on Sunday, July 16, 2017 to take on the Kansas City Royals. The expected starting pitchers are Yu Darvish for the Rangers and Ian Kennedy for the Royals. The odds for this matchup have Texas at -122 and Kansas City at +112. The Rangers have a 40-47-2 over/under mark and a 52-37-0 run line record. The Royals are 46-42-0 against the run line and have a 40-43-5 over/under record. The Rangers have a 44-45 overall record this season. Starting pitcher Yu Darvish has a 6-8 record with an earned run average of 3.49 and a WHIP of 1.13. He has 125 strikeouts over his 118.2 innings pitched and he's given up 93 hits. He allows 7.1 hits per 9 innings and he has a FIP of 3.85. The bullpen has an earned run average of 4.57 and they have given up 294 base hits on the year. Teams are hitting .264 against the bullpen and they've struck out 267 hitters and walked 120 batters. As a team, Texas allows 8.9 hits per nine innings while striking out 7.1 batters per nine innings. They are 15th in the league in team earned run average at 4.29. The Rangers pitchers collectively have given up 782 base hits and 378 earned runs. They have allowed 117 home runs this season, ranking them 10th in the league. Texas as a pitching staff has walked 301 batters and struck out 627. They have walked 3.4 men per 9 innings while striking out 7.1 per 9. They have a team WHIP of 1.37 and their FIP as a unit is 4.74. As a team Texas is hitting .240, good for 27th in the league. The Rangers hold a .429 team slugging percentage and an on-base percentage of .315, which is good for 23rd in baseball. They rank 27th in MLB with 8.0 hits per game. Nomar Mazara is hitting .258 with an on-base percentage of .331. He has 78 hits this season in 302 at bats with 56 runs batted in. He has a slugging percentage of .447 and an OPS+ of 102. 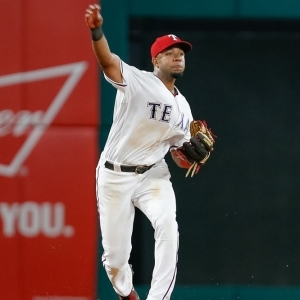 Elvis Andrus is hitting .299 this year and he has an on-base percentage of .343. He has totaled 103 hits and he has driven in 50 men in 345 at bats. His OPS+ is 110 while his slugging percentage is at .467. The Rangers have 716 hits, including 135 doubles and 137 home runs. Texas has walked 298 times so far this season and they have struck out 824 times as a unit. They have left 532 men on base and have a team OPS of .745. They score 5.04 runs per contest and have scored a total of 449 runs this year. Kansas City has a 44-44 overall mark this year. With an earned run average of 4.45, Ian Kennedy has a 3-6 record and a 1.17 WHIP. He has 76 strikeouts over the 87 innings he's pitched. He's also given up 66 hits. He allows 6.8 hits per nine innings and his FIP stands at 5.22. The bullpen has an earned run average of 4.09 and they have given up 281 base hits on the year. Teams are hitting .247 against the Royals bullpen. Their relievers have struck out 276 batters and walked 130 opposing hitters. As a team, Kansas City allows 8.9 hits per nine innings while striking out 7.8 batters per nine innings. They are 14th in the league in team earned run average at 4.25. The Royals pitchers as a team have surrendered 772 base knocks and 370 earned runs this season. They have given up 100 home runs this year, which ranks 26th in Major League Baseball. Kansas City as a staff has walked 291 hitters and struck out 682 batters. They give up a walk 3.3 times per 9 innings while they strike out 7.8 per 9. Their team WHIP is 1.36 while their FIP as a staff is 4.28. As a team, they are batting .248, good for 21st in the league. The Royals hold a .413 team slugging percentage and an on-base percentage of .300, which is good for 29th in baseball. They rank 21st in MLB with 8.4 hits per contest. Mike Moustakas comes into this matchup batting .273 with an OBP of .306. He has 86 hits this year along with 54 RBI in 315 AB's. He maintains a slugging percentage of .559 with an OPS+ of 121. Lorenzo Cain is hitting .272 this season and he has an OBP of .345. He has collected 87 hits in 320 at bats while driving in 30 runs. He has an OPS+ of 103 and a slugging percentage of .431. The Royals as a unit have 743 base hits, including 144 doubles and 108 homers. Kansas City has walked 207 times this year and they have struck out on 664 occasions. They have had 538 men left on base and have an OPS of .713. They have scored 4.15 runs per game and totaled 365 runs this season. Who will win tonight's Rangers/Royals MLB game against the spread?